AFP Imaging's Mini-Medical is setting a new standard for tabletop film processors. 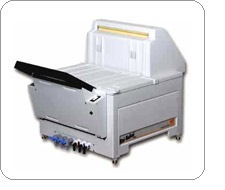 These quality x-ray film processors are built and priced to make in-house film developing cost-effective for small offices, clinics, satellite health care facilities, and mobile installations, by including many time, space, and money-saving features found in higher priced models. Quick and versatile - the Mini-Medical handles films as small as 4" x 4" and as large as 14" x 36" and can process up to 90 14" x 17" films per hour. An optional "No Plumbing" Kit allows the unit to function on self-contained chemicals, making the Mini-Medical ideal for mobile installations or in areas of strict EPA regulations regarding processor effluent disposal.